The St. Louis Park Historical Society was founded in April 1971 by Marie Hartmann, a lifelong citizen of the Park. Its stated purpose was “the discovery, preservation, and dissemination of knowledge about the history of St. Louis Park, Minnesota.” Marie was a dedicated and persistent collector of information, documents, and memorabilia that documented the history of the City. She led the Historical Society until her death in 1996. One of Marie’s greatest achievements was saving the Milwaukee Road Depot from demolition. Built in 1887, the Depot of the Chicago, Milwaukee, St. Paul and Pacific Railroad (a/k/a Milwaukee Road) was originally located just south of the tracks, at 36th Street and Alabama Avenue. It is said to be in the Eastlake style, named for Charles Lock Eastlake, an English architect and designer of furniture. Characteristics of Eastlake style are thin columns, exposed structural members, exterior surfaces are in panels, jigsaw and lathework as decorative details and ornamentation on gables porch posts etc. The original colors were chocolate brown with green door frames. Milwaukee Road Depot, 1920s or ’30s: Postcard from Frank Heyda. The children may be those of Gar Case. By 1893 the Milwaukee Road provided two trains a day into Minneapolis with two return runs. It is believed that the original roof was cedar shingle. It was replaced with asphalt in 1954. John A. “Jack” Felber was the depot agent for the Chicago, Milwaukee, St. Paul and Pacific (Milwaukee Road) from February 25, 1925 to 1966. His wife Flora supplemented his income (they had seven children) by working as a seamstress in a department store in 1930. The photo below is of Felber and Clerk Edith Rue, as published in the Minneapolis Star on February 1, 1955. 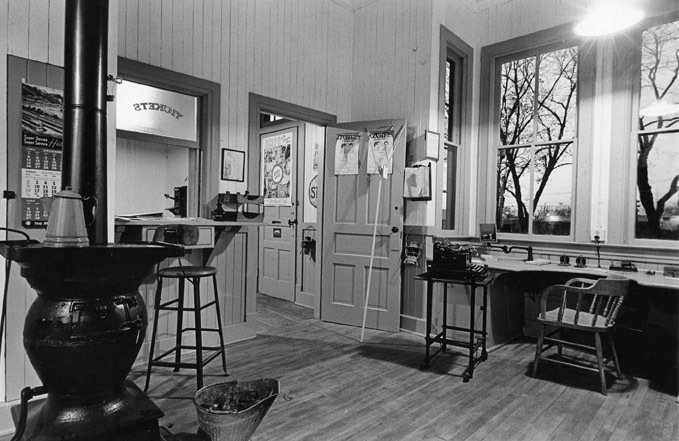 The photo provides a look at the inside of the Depot when it was in use, including the original potbellied stove. During the 1920s the depot was painted bright yellow with orange trim. The train carried passengers until 1955. Freight included farm products, scrap materials during war years, coal, and even caps and gowns for Park High graduation. Doug Johnson has written a detailed description of the function of the depot and its agent. 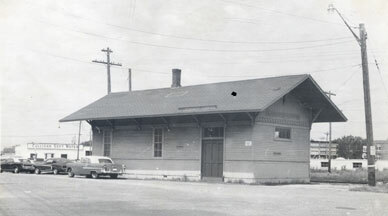 When the railroad discontinued use of Depot in 1968 it threatened to tear the building down. Railroads were starting to be taxed for unused land and it was going to cost them money to keep it in place. Marie Hartmann headed a “Save the Depot” committee that got the building on the National Register of Historic Places on November 25, 1969. 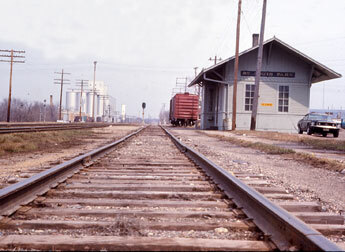 The Milwaukee Road donated the building to the City, and with the help of a Federal grant, the committee was instrumental in getting the depot moved to Jorvig Park in August 1970. Its new address is 6210 W. 37th Street. The building was given an emergency coat of paint in 1970. The only furnishing in the relocated depot was an oil can. Marie and her group were successful in obtaining many artifacts, often from the Milwaukee Road. 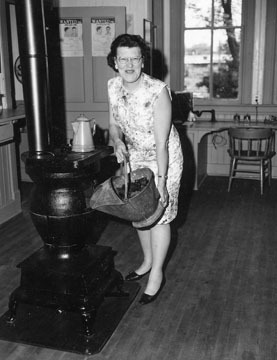 The potbellied stove was shipped in by the railroad from Denver. On May 23 and 24, 1971, a crew of 28 off-duty firemen and policemen gave the depot a new coat of paint. The nascent Historical Society hosted a grand opening of the building on June 17, 1971. The building became the first Park property on the Register of National Historic Places, and is used exclusively by the St. Louis Park Historical Society. Artist Don Skoro and his family restored the depot’s signs. Skoro also sketched the depot, and that sketch became the symbol of the Historical Society, prominent on stationery, membership card, the Re-Echo, and this web site. In 1972 the Historical Society wanted a real railroad car installed on the property, but it was deemed infeasible. 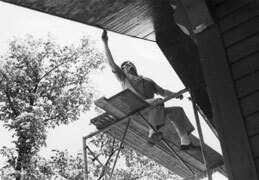 In June 1973 volunteers from the police and fire departments repainted the depot. Postcards from 1976 – still for sale! In 1991 the Historical Society planted a Colorado spruce in the park in memory of Veterans. In 1998 the depot received another coat of paint. To show it off, the Historical Society held an open house on Saturday, October 24, 1998. In 2008 the Depot was repainted on two sides. A memoir about the Milwaukee Road Depot written by the daughter of Depot Agent Jack Felber is available in Something in the Water. 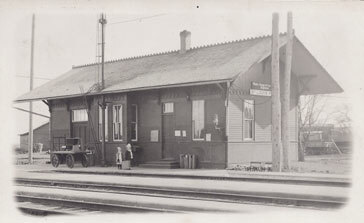 After Marie’s death in 1996, the Historical Society had to regroup and the collection was moved to various locations until it was returned to the Depot. A new board was formed, and since then the Society has worked to care for and catalog the documents and pictures in the collection. Great strides were made in 2004 when the group rented space from Lenox Community Center and purchased new furniture in which to keep much of the collection. Materials pertaining strictly to the railroad, as well as other oversized or fragile materials, are retained at the Depot. In 2011 the City replaced the furnace, installed air conditioning, replaced rotted interior boards, installed a ceiling in the baggage room, and made one of the sliding baggage doors functional. In 2014 the Historical Society moved its office from Lenox to 3546 Dakota Ave. Because most of the research materials that had been stored in the Depot were moved to the new office, the Depot is primarily used for storage and is available to tour by appointment only.